This product is so real, several of our executives have disappeared to catch a peek. 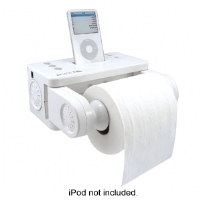 You might run out of toilet paper, but you’ll never run out of tunes with the Atech iCarta Stereo Dock for your iPod. Yes, now you can enhance your experience in any room with your favorite music from your iPod. Hurry, while supplies last. Toilet paper not included.